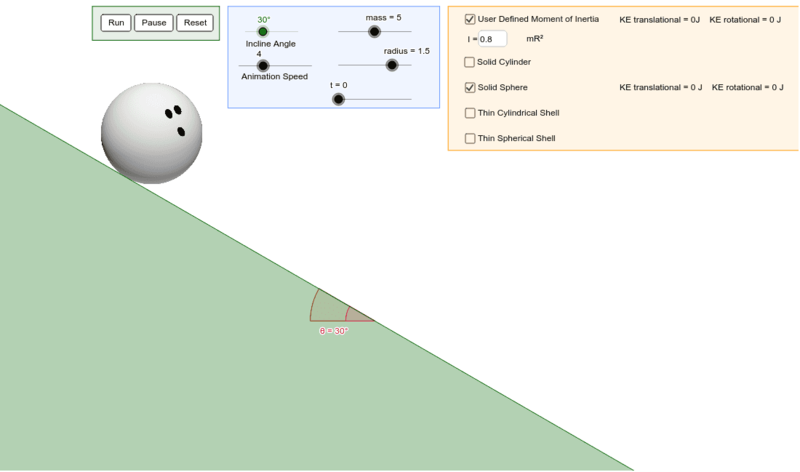 In this simulation, the user can explore the rolling motion of various objects. Use the check boxes to select one or more objects. Use the mass and radius sliders to adjust the mass and radius of the object(s). Use the Incline Angle slider to adjust the angle of the incline. Use the Run, Pause, and Reset buttons to control the animation, and the speed slider to adjust the animation speed. Note: in this simulation it is assumed that the coefficient of static friction is sufficiently large to cause rolling without slipping. This is not realistic at very large angles of incline.